…where Simple And Select Soap Ingredients are carefully blended to create a variety of soap choices for your enjoyment! Sassi ingredients, have been selected for quality and freshness, and then combined into a unique soap collection with options to suit every skin type and fragrance preference. No details are spared: Sassi Soaps are beautifully designed to look as good in your bathroom as they feel on your skin! Our website has been designed for browsing convenience. You’ll find our products grouped and labeled according to ingredient content. If you’re in search of vegan soaps, check out our Very Veggie section. Creamy milk soaps are found in Milk ‘N More; refreshing “spa” or salt bars reside in Salt ‘N Sun, and last but by no means least is Sassi’s Castile 4 Real — soaps made of 100% olive oil and aged to perfection. 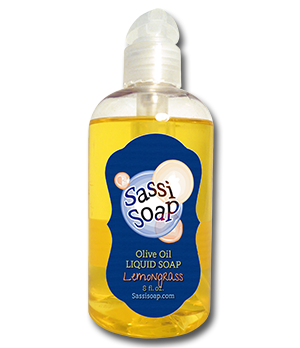 Joining Sassi’s soap is our bath and body products collection, which nicely complements the gentle, refreshing clean of Sassi Soap. Organic oils, phthalates-free fragrances, essential oils and paraben-free preservatives are all here. So treat yourself or someone on your gift list. If you enjoy using our soap as much as we enjoy making it, we can look forward to the start of yet another Sassi Smile!